Do you wish your Lambretta could tow your truck home if it broke down? And would you love to have that kind of torque without breaking the bank? Or maybe you dont want to cut off your battery tray and hack up your cylinder shroud just to fit a reed valve kit such as the TS1 or Monza? Well, we now have AF Rayspeed Rapido 250 kits in stock, and they pack a wallop! The Rapido 225 kit has developed a reputation as an affordable way to get gobs of power out of a 200c Lambretta engine, and the 250 kit builds on this reputation with a high quality forged 72mm piston travelling through a special version of the 225 cylinder with a thicker skirt to support the mammoth piston. When combined with a 60mm long stroke crankshaft, the kit delivers 244cc of grunting, stump pulling power - the kind you need whether climbing the Adirondacks on the Cannonball Run or embarrassing the O.C. Chopper types in full view of their girlfriends during a weekend blast down PCH. Great stuff! The kit will work great with any size carb from 24mm to 35mm, and any exhaust from a GP200 big bore system to any number of expansion chamber systems. Low RPM torque will be maximized with a smaller carb (24-28mm) and a GP200 exhaust, while unbelieveable midrange and top end power can be had with a 32mm or larger carb and an expansion chamber. Because the kit has an oversize skirt and requires a long stroke crank, both the cylinder spigot and the crankcase area of the engine case must be overbored. We offer this service for an extra fee (see labor item #0250.F250). 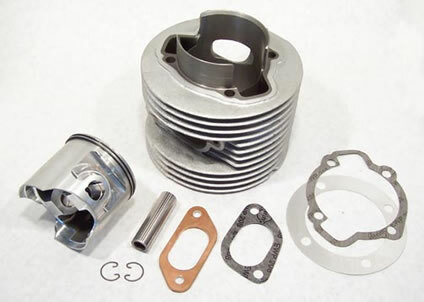 The kit includes the cylinder, piston assembly with rings, wrist pin, and circlips, and a special top end gasket set. Also needed will be an Indian GP200 or AF Rayspeed cylinder head which has been reprofiled to suit the gargantuan piston crown and ccd to match the octane of fuel and type of exhaust that will be used. We offer this service for $65.